None of this conduct was punished in any significant way. On November 7, 2011, the New York Times published an article based on its own review of major banks’ settlements of SEC lawsuits since 1996. The Times’ analysis found fifty-one cases in which major banks had settled cases involving securities fraud, after having previously been caught violating the same law, and then promising the SEC not to do so again. The Times’ list, furthermore, covered only SEC securities fraud cases; it did not include any criminal cases, private lawsuits by victims, cases filed by state attorneys general, or any cases of bribery, money laundering, tax evasion, or illegal asset concealment — all areas in which the banks have numerous and major violations. 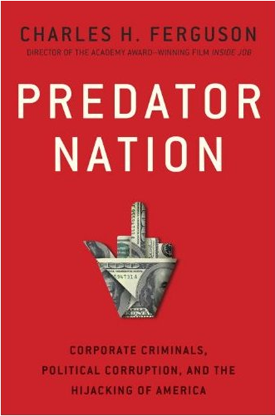 In Predator Nation, I provide detailed, well-documented accounts of behavior ranging from assisting Enron’s frauds (Citigroup, Merrill Lynch), to fraudulently exploiting the Internet bubble (most of the major investment banks), to using for-profit colleges to exploit government student loan programs (Goldman Sachs), to assisting in money laundering and tax evasion on a large scale (at least eleven banks including UBS, Barclay’s, and Lloyds), to using bribery and artificially complex derivatives to destroy the finances of a county government (JP Morgan Chase), to profiting from Bernard Madoff even while strongly suspecting him to be a fraud (JP Morgan Chase, UBS).